This is a new startup blog for Operation Write Home...and we need your help to get it going! 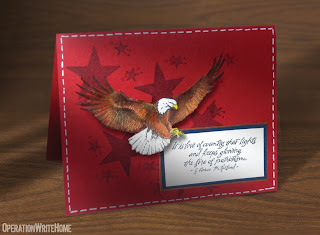 Content will be generated by our cardmakers....whatever you'd like to see. This blog will be able to do things like host challenges (weekly? monthly? whatever YOU want! ), inspire you with tutorials, and encourage everyone to follow and visit each other's blogs. Help us think up what else could be done here! The first thing we need is a name—list your suggestions in comments on this post, and we'll put them up for a vote amongst our bloggers when we get a list....and then we'll purchase a url, and decorate up the blog accordingly! Once we get some plans going, we'll put a link to this blog on our website.....let's pick a name! how about "Operation Blog Home"!? not very good but let's get the ball rollin'! I think if we keep it simple or similair, other crafters, service members or families will be able to find us easiy with a web search. I kinda like Judainne's suggestion of Operation Write Home-Base. Instead of Stars and Stripes, get it? I like the Circle idea; it makes me think of the old quilting circles. How about "OWH Stampers' Circle"? I love the Stampers Circle Kate suggested. What if we took a spin off OWH and were Operation Make Cards or something to that effect? I think we need to keep the OWH in the title to help people find the blog. One Two Three Four...let's go!